A Habit of Character at our school I absolutely love is compassion. We intentionally put time and effort into teaching and demonstrating how compassion looks, feels, and sounds. We find amazing ways to celebrate each other’s differences! Not one student is the same, not even twins! The same goes for students who qualify for extra support under the special education umbrella. There’s always an initial shock when schools or outside services tell a parent their little one qualifies for special education under a specific disability (learning disability, autism, emotional impairment, etc). We understand the anxiety these words may cause due what most of us have experienced in education. Disability is defined as “a physical or mental condition that limits a person's movements, senses, or activities” but the special education world is constantly evolving towards the student and how we can help them be successful as we support them through their school journey. At our school, we believe every student can achieve beyond what they think they are capable of and our students are capable of doing their best and more- there are no limitations of what they can do and our students are always surprising us! Which is why we use the term differences instead of disabilities. This may be a shift for a lot of educators and our community as special education has grown so much over the past few years, but we still have a ways to go. In the mid-18th century, people with disabilities were seen as a liability in social and economic participation but in the early 19th century, the French brought pioneers on special education to the US and Canada and soon enough, institutions began developing new ways to help people with disabilities, in other words, exceptional individuals. In those days, however, the goal of these institutions was to protect the “vulnerable” children with needs from the world, which in a way, was very limiting. Move forward to the 1900’s and we see the development of special classes in which many of us grew up seeing in schools. Then in the 1980’s, education was going under major waves of reform and special education began to shift from special education classes to mainstreaming and inclusiveness which is where we are today. 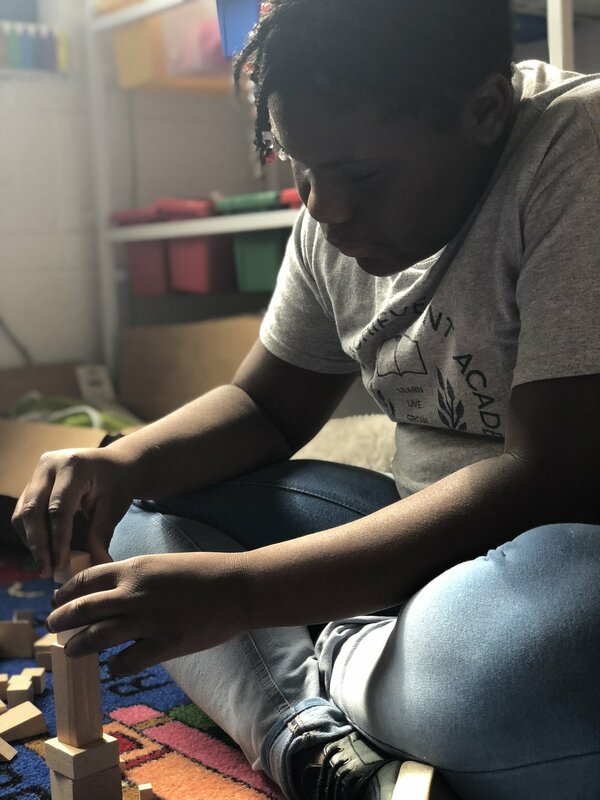 Although those special classes still exist in some schools, the beauty of what we do here is that we are helping our special friends be in the least restrictive environment. We help them be part of their community without hindering their talents and special abilities. Together, we are making our world a more inclusive one that celebrates each other instead of ostracizing those who are different than most of us. This year, DAA expanded to have a 6th grade crew, which means we officially have a middle school! These middle schoolers are spending an hour of their day in an “advisory” class. Depending on the day, middle school advisory is spent in many different ways: some advisory periods are split by gender, others by preference, and each span a range of topics which interest and appeal to a middle school student body. These topics could range from personal finance to health and hygiene. Etiquette may be explored one week, while stereotypes and societal norms will be discussed the next. Many of the middle school advisory topics were selected by the students. In expanding their curiosity and responsibility, our students chose topics that would be relevant to their experience not only as middle schoolers but as future high schoolers and active members of our Detroit community. In a recent middle school advisory meeting, students explored elements of cooperative play - an element of middle school in which students practice, discuss and discover sports which they may experience in high school. This has become a time when our middle school students have been able to express themselves, push their comfort zones and feel safe and comfortable in the presence of adults (outside of regular crew meetings). These meetings are intentionally geared towards the mindset, skill-set and unique stage of life of the middle schooler. The focus remains on relationship building between students and also with their teachers. With high school and college on the horizon for our middle schoolers, we hope to be teaching the whole child to achieve in the range of settings in which they will be placed. Middle school advisory teaches, challenges and practices the social, emotional and fundamental pieces of maturing into adulthood, and is a treasured time in the day of students and staff. In the first module of our 5th Grade curriculum, we explored the question, “What are human rights, and how do real people and fictional characters respond when those rights are threatened?” During our module lessons, we read the novel Esperanza Rising which is about a young girl who moves from Mexico to California during the Great Depression. In addition to reading the novel, we also did close readings of numerous articles of the Universal Declaration of Human Rights (UDHR). We used what we learned from reading the UDHR to identify events in Esperanza Rising where a character’s human rights were threatened. While our thinking about human rights and what it looks like to have those rights threatened could have stopped there, we used our labs block time to take it a step further. Students broke into groups and read articles about current and past events. They then worked to identify how the articles provided examples of human rights being threatened. For example, one group researched the story of Dr. Ossian Sweet, a successful African American physician who moved to Detroit in 1924 and bought a house in a predominantly white neighborhood. Students identified how his “Right to Property” (UDHR Article #17) was threatened when white mobs attacked him and his family shortly after they moved into their new house. Another group looked at examples of voting rights violations and identified how UDHR Article #2, “Don’t discriminate”, was threatened in those instances. Based on what they learned from their research, students then wrote monologues from the perspective of someone who lived through the event they studied. During their module block, students worked to understand what makes an effective monologue by studying model monologues and analyzing the characteristics that made them engaging. Again, we extended that work into our labs block as students worked with their groups to write their monologue using the details they had learned during their research. Finally, it was time to get ready to perform our monologues! Students identified the attributes of fluent readers and then practiced, practiced, and practiced some more in order to prepare to perform their monologues. While we love the learning that takes place during our module lesson, we are so thankful for the opportunity to extend our learning during our labs block! DAA is excited to continue offering academic intervention to all grades K-6 with Mrs. Bradley (2nd-6th grade), Mr. O’Brien (K, 2nd, & 4th grade), Ms. Turner (1st grade), Ms. Shanell (Kindergarten), and Mrs. Stoeckle (3rd & 4th). 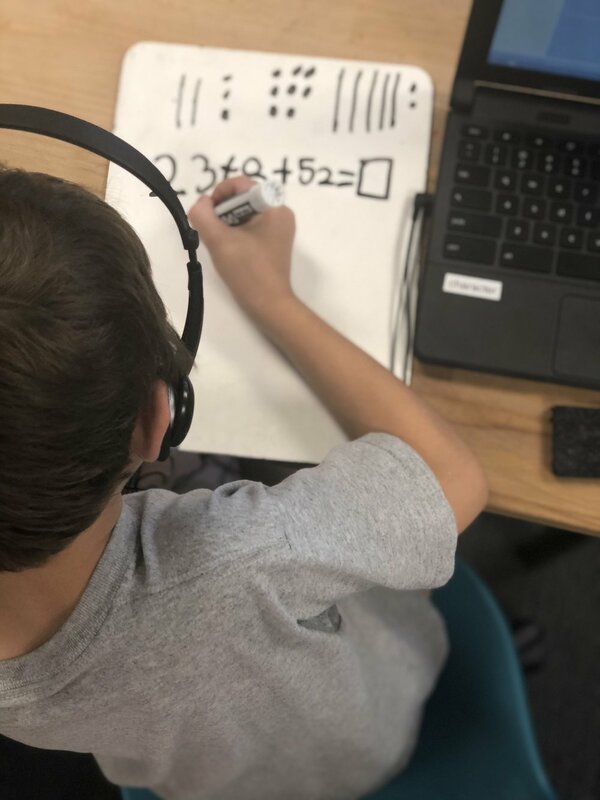 Academic intervention is provided to children with the most need and opportunity for growth in each classroom based on NWEA MAP data, reading levels on the Fountas & Pinnell assessment, and benchmark assessments to measure where a child stands academically in math. These tests are given to help us create groups of children that need the most assistance in math and reading. We then use these data points to create an instructional plan that addresses their biggest weaknesses. At the beginning of the year we tested all children to find out baseline data for reading and math. After all of the initial testing, we rolled out the official start of intervention using Fountas & Pinnell’s (F&P) reading intervention or a scope and sequence that works on important reading skills for each grade level. Number Worlds for math. Each round of academic intervention will last six weeks with the same caseload. After six weeks, each child in intervention is re-tested in math and reading using the F&P test and Number Worlds assessments in order to see if they are still the most in need of intervention or if they can graduate off of the caseload. The Fountas & Pinnell intervention is a curriculum for small-group reading instruction that gives students access to books on their level to build them into successful readers. These lessons will help create a foundation for our readers in order to move from learning to read to reading to learn. Number Worlds is a math curriculum based on Michigan state standards that allows kids to play games that apply the math that they are working on to real world problems. The games have proven to be very engaging and keep our kids focused on the math. Each child is seen at least three times per week in group and are given a short assessment at the end of each week in order to ensure that they are internalizing the information taught that week. Through intervention we aim to give our children the opportunity to do well and grow to or above grade level and be successful without additional intervention. I recall when I first became a Lead Teacher at DAA, and we learned about Crew. I thought, “Wow! This is just like how I facilitate my morning meeting, but BETTER!” I used a structure, similar to crew that included a morning greeting, a share, an activity, a debrief, and a morning message. Through morning meetings, I was confident that I was starting our day off on the right foot, and that students were building community through activities and sharing. However, what I didn’t realize when I began teaching was just how valuable a daily morning meeting was to the social and emotional development of a child. The motto We Are Crew, Not Passengers is shared amongst student crews as well as adult crews across the EL network. Being apart of a crew means you have a team to work together with to solve problems, and depend on. A crew encourages one another, compliments each other’s faults and strengths, and pushes everyone in the crew to achieve great things! As with all schools, kids move and change schools for various reasons. When a new student comes to DAA, Crew is a vital resource to share an inclusive community where everyone feels welcome and cared for. To build that inclusive community, it is so very beneficial to incorporate moments for students to laugh together, build trust, and practice communication and social skills. This will lead to students eventually sharing personal things about themselves that make them unique and special, students being vulnerable to discuss challenges in order to address and overcome them, and even spark new friendships! Crew gives students opportunities to practice social interactions and to be apart of a community where they can feel safe to be themselves and take risks to grow and succeed. By nurturing students social emotional skills during this time, we can help learners to manage emotions better, effectively communicate with others, and build a communal environment where all crew members feel safe and welcome. Over the course of the year each student at DAA become an expert in 4 different topics during their ELA class. The topics are split up into what we call modules and are based on the EL Education ELA curriculum. Students engage in meaningful and authentic research throughout the each module including reading complex text, interviewing experts and field study. By the end of each module, students create an authentic final product and present it at our celebration of learning. Final products push students to do more than they ever thought was possible. In the past DAA students have published books, organized voter registration and produced podcasts. In order to invest students in this deep and authentic learning, we have to get them excited as soon as the module begins. At the beginning of each module every crew participates in a series of activities called the module launch. Launches can last from one class period to several days. During a module launch students engage in activities designed to spark their sense of curiosity. They explore resources related to the learning that they will do. They solve mysteries about their topic. Sometimes, they even start to analyze models of the final products that they will eventually create themselves. These launch experiences not only engage our students, but they also promote equity. Kids come to crew with a variety of experiences and interests. This means that they have varying levels of background knowledge related to any given topic. Participating in a module launch allows all learners to access the content and start to become experts regardless of prior knowledge on the module topic. During the first module, our students studied Greek Mythology, a topic that most students were unfamiliar with. Students started their launch week with an amazing race. They were split into teams. Each team had to discover which figure from Greek Mythology represented their team. They completed a series of challenges designed to introduce them to common myths. After completing each challenge, they received a clue. During one challenge, students read about the myth of Arachne’s Web and completed the spider web challenge on our new low ropes course. In another challenge, they had to complete a team building activity to make their way to Mount Olympus. After each team completed the amazing race we celebrated with a few chants and cheers. Then students immediately dove into analyzing what would eventually be their final product, a myth that represents one our our DAA habits of character. Module launches are really powerful experiences. They spark academic conversation, expose students to rich content and allow us to continue to maintain a strong sense of crew. Our first launch of the year was in September, and still, students are talking about as they finish our their first module. In our Kindergarten crew’s first literacy module this year, we have been working to become experts about toys and play. We explored the questions: What can we do to make playing together fun? And What toys do others prefer? Why do they prefer them? We started our study by exploring different types of toys and describing attributes of toys. We then learned about what toys others prefer, first by learning about toys that kids from long ago played with and then by working with a partner to discover what toys they prefer playing with. To culminate our study of toys, we organized a school-wide toy drive to collect toys for the Children’s Hospital of Michigan, and created tags to go with the toys that include a picture of the toy and two sentences of writing about how to play with that toy. One way that we were able to learn about and become experts on toys and play was by talking with and interviewing experts about toys and play. We started our module by interviewing a Child Life Specialist at the Children’s Hospital of Michigan, Ms. Sinead. This interview helped us understand about why kids in the hospital need toys and what kinds of toys they like to play with. We learned that children in the hospital have a play room that they go to to ease the stress of their treatments and to feel less lonely when they are away from their friends, family, or school. After we interviewed Ms. Sinead, we were able to come up with a list and create posters for our toy drive of which types of toys the Children’s Hospital needed and requested. We continued to learn from experts throughout our module! When we learned about what toys others prefer and toys from long ago, we interviewed a classmate’s parent, who brought in two toys she had when she was a child! This helped us to understand what toys others prefer to play with and how toys have changed from long ago to today. Finally, we interviewed a student at DAA who spent some time at the Children’s Hospital a few years ago. He told us about what the toy room at the hospital was like and how going to the toy room helped him get through his illness and bring a smile to his face when he was away from his toys at home. Kindergarten students asked good questions to get a feel for why it was important to donate toys to kids who don’t have any, and throughout the writing and drawing of their toy tags, were passionate about making their work the best it could be to be able to support a real purpose. Learning from and interviewing experts is one of the best ways to deepen our learning at DAA. Not only does it help students practice speaking and listening skills, but it also brings a real purpose to what we are learning and helps students make connections to the real world! On October 24th - 26th, we (Tommy Anderson, School Social Worker, and Mario Lemons, Behavior Interventionist) were able to attend an international conference on restorative practices. Conferences run by the International Institute for Restorative Practices have been held all over the world, we were lucky enough to have this years occur here in Detroit. Participants came from far and wide, representing nearly every state and over 25 countries! Breakout sessions ranging from “The Critical Role of Youth in Building Restorative Cultures at Schools” to “Using Restorative Practices and Mindfulness to Build Relationships and Heal Trauma” to “Bridging ‘Behavior’ Gaps: Strategies and Interventions for Challenging Students” informed and enlightened us along the way. Nearly every session began with data. Schools across the nation are reporting a reduction in serious infractions, a reduction in recurrent problematic behaviors, a reduction in suspensions and an increase in prosocial behaviors. Furthermore, Restorative Practices is equitable. It has been proven to reduce racial gap in defiance and misconduct referrals. In an educational climate where Black students are 3x more likely to be suspended as their White counterparts, the importance in making our practices more equitable is paramount. If you’d like to see more data surrounding Restorative Practices, follow this link. 2. Restorative Practices is one piece of the puzzle. Restorative Practices are best utilized in schools alongside Positive Behavior Interventions and Supports, as well as social-emotional learning. In the school setting restorative practices do not live in a silo. They interact with other systems to help manage and respond to behaviors. Allowing Restorative Practices to interact and be a part of other systems of the school are when it becomes most effective. 3. Proactive Practices are key. A common theme throughout the conference was the importance of establishing norms and relationships with those you work with. Proactive circles are key in building community. Building trust and getting to know those in your class before you need a responsive circle increases the effectiveness of the circle. 4. Data collection is an integral part of the process. How do you know if something is working? How can we replicate our success year after year? Data collection! Not just outcomes, but collecting information on the fidelity of the implementation of programs. As we continually refine our restorative practices data collection will be an integral part of knowing what adjustments need to be made. 5. Restorative Practices should live in every inch of the school. Restorative Practices in a school does not work unless it is present in the very fiber of the culture of the building. All community members must buy into it. It cannot only be the way that student off-culture behavior is addressed, but it has to also be what guides staff to student relationships, informs staff to staff interactions, as well as the way that schools engage families and the community as a whole. It is when (and only when) schools adopt restorative practices school-wide that one will see a genuinely restorative community. 6. Restorative Practices take time, reflection and patience. The ideas of restorative practices are not a new concept for various communities historically and abroad. However, the movement to fully incorporate such practices into schools has been the buzz in the educational sectors more recently than not. As a result, the implementation thereof doesn’t come without both unintentional and intentional resistance. Traditional educational systems are innately punitive in their response to off-culture behaviors, therefore, the transition to a more restorative environment takes time, thoughtful reflection, and patience from all stakeholders in each school community. 7. We are doing a lot right! 8. Our work is never done! Similar to the way that professionals in the medical field consider themselves practitioners of medicine- the very essence of becoming a restorative community is rooted in the idea that it’s an ever growing a developing process. It takes constant reviewing, reflection, readjusting to meet the specific needs of the community. This is why it is said to be Restorative Practices. It embodies the thought that “our work is never done!” Because this philosophy is human relationship focused, it is innately a journey- a commitment, and a process that never ends. But the potential outcomes of a completely restorative community is worth it all.